Comment: Measuring and hanging vertical blinds for three windows in bedroom. Comment: The drawstrings on my blinds have snapped. . . no longer working. And some remote-controlled blinds that are too high for my ladder do not work as the batteries are dead. Comment: moving into new duplex down apt.. Need a business to install window treatments. Comment: Trouble shooting horizontal blind in bed room. Evaluation of vertical blinds in living area windows ( four bays) replacing the vertical blind sheets. Comment: Rectangular window above bed, want blinds that are remote controlled battery operated, ideally sitting inside the window, and not above. Comment: I am purchasing a one bedroom, 1 bath condo. The closing is May 17th. I need good ideas for the window in the living room (and, because the sun is coming in very forcefully because it is the lakefront, I need something that keeps the light out, yet looks wonderful) and bedroom. 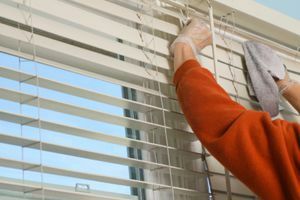 Eddie Z's Blinds and Drapery, Inc.
Chicago Window Treatment & Covering Companies are rated 4.74 out of 5 based on 838 reviews of 40 pros. Not Looking for Window Coverings Contractors in Chicago, IL?